When the discussion about incorporating a medicinal plant product like Noni juice into the diet as a means to enhance a healthy lifestyle or used to aid the body to recover, it is often met with some skepticism from family members, friends and even online posts. The news media often runs stories that quote doubtful doctors who give dyer warnings about its use or effectiveness. They warn us not to mess around with natural plant extracts found in products like Noni juice. They say you will be playing with fire. They say with natural foods it’s hard to guarantee an effective dosage to take in order to realize or experience the desired results. What they mean is without a proper dosage control, you can’t possibly know how much of the active ingredient or bio-chemical compound that exerts the efficacy for the product being used. This is particular true for companies that manufacture products that contain less expensive fillers. To some extent, the skeptics are correct. Pharmaceutical drugs manufactured by humans offer a precise amount of synthetic chemicals needed to perform a specific response by the body. But, it’s different with natural herbs because to potency can vary again from how it’s produced and how much of the actual active ingredient is in the product packaging. What’s more is how much time the product sits in a warehouse and store shelf before being bought. These warnings about the amount to use can obscure the more important truth. And that is when used as recommended by a reputable alternative health practitioner, medicinal herbs are always less potent then their pharmaceutical counterparts along with the reduction in those nasty side effects found in synthetic drugs. So with most herbal remedies like pure Noni juice, the risk of overdose or a significant side effects is almost nonexistent. As with any product taken into the body, the critical thought before ingesting any medicinal herb, or vitamin is to read the label carefully. It’s not wise to take just any herb because a friend or family member said it worked for them – unless that person is a medical doctor or an experienced clinical herbalist. Tru Noni juice from Hawaii contains a standardized amount of the key active ingredient, Morinda citrifolia, in each one ounce serving. But, unlike pharmaceutical products, Tru Noni dosage can be experimented with the amount needed to receive the desire results. Just like any medicinal herb or dietary supplement, if you have an ongoing health problem or are taking a prescription drug, it’s important to consult your doctor or healthcare practitioner before beginning any new regimen. Tru Noni juice is an awesome product. 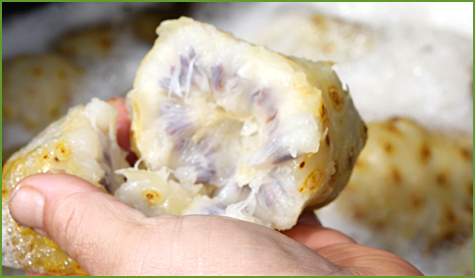 I like your up close picture of the Noni fruit. I once was skeptical of Tru Noni juice after my wife started me on it last year. I can say now it works for me. Tru Noni juice changed my life. I would rather take a natural product like Tru Noni juice then synthetic products made in a lab.